As part of the Mercedes’ High Performance Powertrain unit, Andy Cowell can take a great deal of satisfaction for the 2014 dominance of the Mercedes engine and power unit. Cowell has worked on the engine development side of the Mercedes outfit for more than a decade, but was promoted to managing director of HPP, as a result of years of hard work. Cowell studied Mechanical Engineering at university, and joined Cosworth Racing as a graduate. He moved through several departments to get a taste of each, settling in the engine development area. He spent several years with the team, but left in 1999 for a year with BMW, helping to steer an engineering group to design the power unit for the Williams BMW team. After the year away, Cowell returned to Cosworth as a principal engineer, but was soon on his way again. In 2005, he joined Mercedes, working on their V10 project. 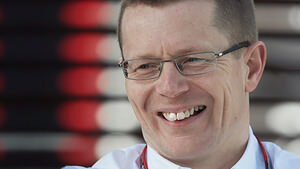 He was promoted to a chief engineering role for the V8 era, and led the development of the new KERS technology. Cowell became an engineering director for Mercedes Benz High Performance Engines, and at the start of 2013, he was promoted to managing director at HPP. Cowell naturally works very closely with the Mercedes works team, and was their representative on the podium for the winning constructor at the Australian Grand Prix. However, they also supply Force India and Williams, with McLaren signed until the end of the 2014 season. During Friday's press conference Mercedes HPP director Andy Cowell and Renault Sport's director Rob White were asked to discuss the influence new F1 regulations have on road car technology. Both were adamant that the sport can help develop solutions that can be eventually transferred to the road. "The regulations were specifically written to take some of the ideas already in the road car world," said Cowell. "Downsizing, downspeeding and turbocharging but adding some new, interesting technologies in there such as the electric turbocharger as a specific example and those sort of projects are already being worked on. "White further expanded on those thoughts, "It is a big leap, as Andy says. I share the remarks that transfers are already happening. The transfers are not only specific technologies, the e-turbo being one of them, but also the fundamental alignment of the mission we have. Our challenge now is to race, to go as fast as we can with the given fuel allocation, which is a very, very similar mission to our road car colleagues who have to use the smallest amount of fuel to get a given mission done and that’s extremely close."